One of the many awesome events we've had the pleasure to print shirts for and participate in this year was the Omaha Buddy Walk held at Aksarben Village. The event is held annually to support families and promote community involvement and encourage a lifetime of opportunities for people with Down syndrome. It was a beautiful day to be outside and enjoy the morning activities amongst friends and family. Our team "Landon's Luau" and our bright orange Gildan 50/50 blend t-shirts with navy print not only stuck out amongst the crowd but also matched the colors of his family's favorite football team the Chicago Bears! 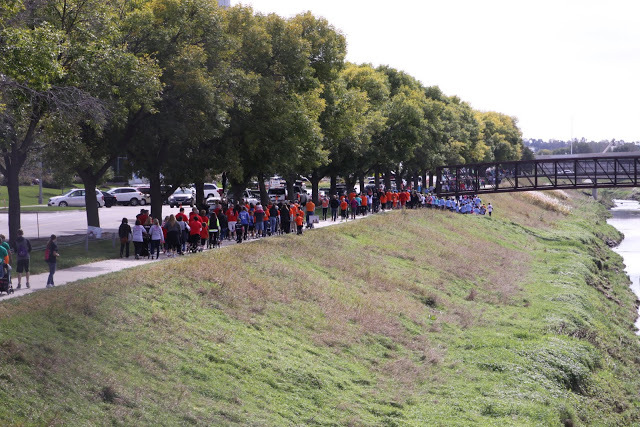 This was our first time being involved with the Buddy Walk and we're looking to do it even bigger next year! !